As the millenium dawned, e-learning represented a significant opportunity for all organisations, but delivering the benefits required skilled people who understood e-learning models and specialist products. Fosway’s early experience with e-learning indicated that success would be about much more than simply putting content online. This paper explores our E-learning Framework Model and the recommended steps to consider when implementing e-learning in your organisation, many of which remain true today. Corporate e-learning, whilst currently a relatively small part of the overall training and education marketplace, is in the early stages of development and growing very rapidly. In a recent study of large corporates, 66% of respondents reported they were using, or were planning to use, a learning portal in the near future. The on-line training market is forecast to double in size for each of the next three years, reaching approximately $11.5 billion by 2003. • The frameworks and methodology developed by Fosway provides the foundation and models to allow the rapid development and implementation of your corporate e-learning solutions. • Increased flexibility and ability to respond to evolving business requirements with rapid roll-out of new and organisational-specific learning to a distributed audience. • What really is e-learning? • How does it differ from existing technology-based training? • Is it more effective than existing computer-based training? • Can we replace some of our instructor-led classroom training? • What kinds of e-learning tools and technologies should we be looking at? • How do I develop a coherent strategy for e-learning? The purpose of this series is to help you start to answer these questions. We will summarise our understanding of what is happening in this emerging market place, and the key issues you should consider. As with many evolving technology-related terms, especially ‘e’ terms, e-learning encompasses many different things. The term e-learning has really emerged in the last two years and is being used to cover almost any technology-supported learning initiative. Fosway has been working within the e-learning market-place since 1996 and has extensive experience of corporate and academic projects in this field. In our view, e-learning needs to be thought of as the ‘combination of learning services and technology to provide high value integrated learning; anytime, anyplace’. To illustrate, here are some examples of where e-learning has been successfully applied. • A major corporation uses interactive web-based courseware with integrated instructional support and online forums to deliver a large-scale Enterprise Resource Planning (ERP) rollout programme. • A British business school introduces online MBA programmes for its key corporate clients using Lotus LearningSpace with a strong mix of tutor-facilitated forums, on-line content and access to external resource libraries. • An insurance company uses Centra Symposium to interactively train their field sales force at home using monthly synchronous sessions with supporting on-line materials, instead of quarterly classroom training in hotels. • A pharmaceutical company re-engineers its induction programme to reduce classroom time and increase levels of learning by using an on-line learning environment with a new employee discussion forum. • A management consultancy uses an e-learning environment supported by on-line coaching to improve the quality of sales proposal writing. The above examples are typical of the type of learning requirements we encounter on an everyday basis. All of them are using technology to enhance or transform a learning process, achieving real business and educational value, and reaching a larger, more diverse learner population. • How do I determine whether e-learning is applicable to my requirements? 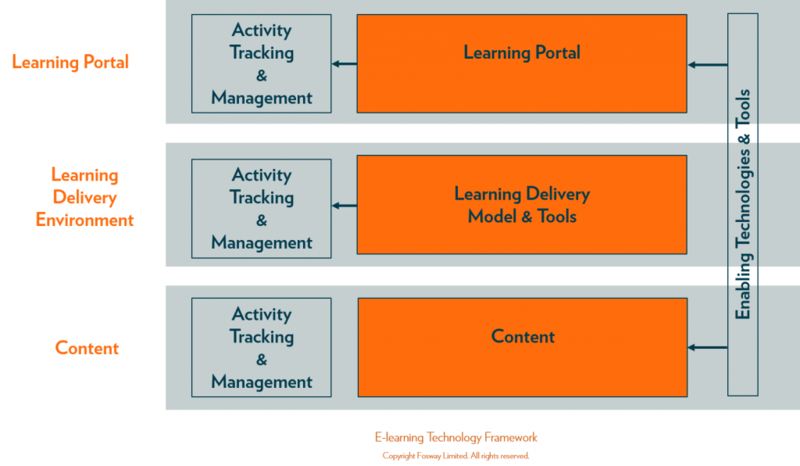 • How do I construct an e-learning programme? • What are the issues associated with designing and developing a solution? • What products and tools do I use to support the delivery of the programme? The rest of the white paper will focus on these issues. Before we dive too deeply into the issues and technology concerned with implementing an e-learning solution, it is important to review some fundamental issues associated with constructing the e-learning process in order to deliver real learning. As has been already introduced in the previous sections, on-line learning is not new. We have been using CBTs in various forms for over 10 years. However, experience from CBT and more comprehensive e-Learning projects indicates clearly that success requires more than just putting content on-line, be it CBT or HTML pages on a corporate website. • Developing senior management programmes to enhance business performance and stimulate business creativity. E-learning can have a role in fulfilling any or all of these requirements, and in some cases could provide the complete solution. Understanding the underlying dynamics of the learning requirement, and being able to map them into a viable learning approach which can then be implemented, is fundamental to any success. Taking our examples further, the logistical demands (lots of people, very short space of time) of the company takeover announcement probably mean that a pre-written presentation and a Frequently Asked Questions (FAQ) document need to be distributed to everyone quickly. But this solution never answers all the questions or gets feedback from the organisation. More importantly, it doesn’t allow the employees to feel part of the change process. Implementing a controlled forum to support the information transfer and answer key questions would increase effectiveness considerably. Training a field sales organisation is a constant requirement, but has a very high opportunity cost if attending classroom training is involved. Pushing information out to the already-overloaded sales staff does not provide an effective learning approach, as there is no way of tracking what they have absorbed. In this case, creating an on-line (e-)learning community which the sales team can access from their laptops, wherever they are, would provide a better environment to manage learning and improve sales effectiveness. Specific product or legislative training can then be delivered in a controlled way on an ongoing basis. However, given the nature of the training and the audience, it is critical that this education isn’t just information push. The sales team needs the chance to discuss and understand the implications of the new products: how do they compare to the existing range or that of the competition? This e-learning environment needs to be actively facilitated to manage discussions and gather feedback. It also needs subject experts to provide direct support and answer questions. It needs some content too – everything from product specifications and presentations to industry analysis, external references and specific customer experiences. This integrated environment then becomes a highly effective learning and development solution for the sales force and an on-going reference tool. In the case of the senior management programme, there are likely to be key components which need to be done face-to-face in a facilitated workshop environment, probably including peer review and input from external industry experts. The trouble is, to do this properly you probably need 10 or more days, and that’s just not feasible. However, if this process is restructured as an integrated e-learning programme, the face-to-face time can be reduced significantly, maybe to a two-day initial session, followed by a month of facilitated on-line collaborative and coached development, followed by a final two-day session. In this case, whilst there might be some pre-defined materials, much of the structure will develop during the workshops and on-line coached and collaboration sessions. Resources of all kinds, particularly documents and references to external resources are critical, and are probably added as the specific context is developed through the learning process. Neither the audience nor the subject lend themselves to fixed structures or to lots of ‘click-and-turn’ content. The online environment is discussion and action-centric not content-centric. The focus is on outcomes not structure. All three of the above examples represent a very different approach and a very different e-learning experience. The design, the level of importance attached to core components of the learning structure, the nature of the content, participation and instruction/facilitation, are all specific to the context in which they are found. Applying the same approach to each of the above situations would be disastrous, resulting in very poor outcomes and low e-learning value. By evaluating many e-learning scenarios, we have developed models to enable us to better map the types of learning requirements to the critical learning dynamics – the structure, content, participation and instruction/facilitation elements. This information can then be constructed as an e-learning programme model and used to help us identify associated technology support. We represent this mapping process using an E-learning Dynamics Matrix. The version below is greatly simplified, with a restricted set of e-learning characteristics and learning models. This matrix can be applied to the defined learning requirements and gives us a clear understanding of the relative role of the different components and determine the nature of them. 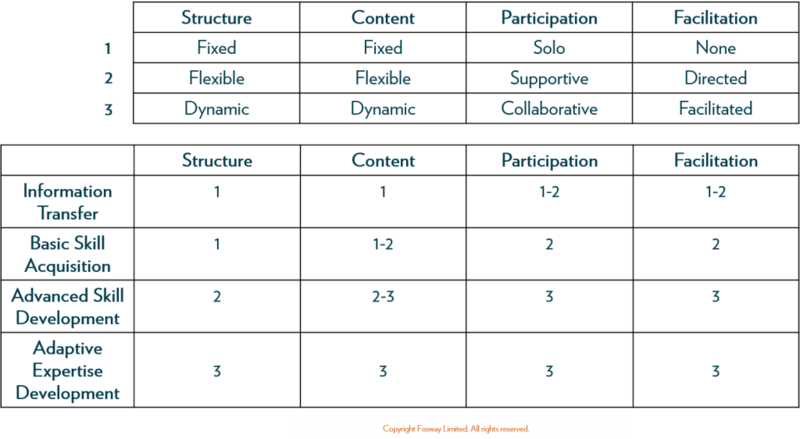 For example, it can tell us which fixed learning structures are appropriate, whether content needs to be flexible in form (multiple types), the degree of collaboration required, or if instruction is needed and what form it might take. Here are some examples of the application of the E-learning Dynamics Matrix, including our three specific examples discussed above. 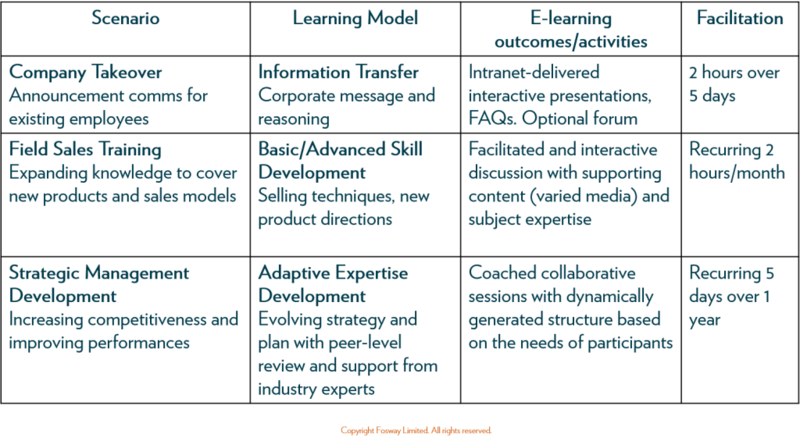 As you can see from the table, the application of the simplified E-Learning Dynamics Matrix enables us to map from a Learning Model to an e-learning outcome which outlines a learning approach. This approach can then be mapped into an e-learning solution (see later in section on ‘Building e-learning solutions’), which defines the characteristics of the underlying e-learning platforms and helps to determine the types of products we need. Of course, this mapping process is not the whole answer. As well as these considerations there are other important factors, including the specific subject matter itself and how that lends itself to on-line representation. Also we need to consider the students themselves, delivery logistics, technology and infrastructure, longer-term strategy and so on. But, by understanding the underlying nature of the learning requirement and the key dynamics of learning associated with it, we can at least start to map out a sensible way of delivering it, and ensure that we are constructing an e-learning approach where we deliver real learning value. Too often people consider e-learning as a straight replacement for classroom training or as an implementation of a Web-based CBT course. In fact, the most common approach is to select a tool or product and plan to implement existing material in that product. Often these approaches fail to achieve the expected benefits. Why? A whole segment of the learning experience has been omitted – the Learning Delivery Environment. In this area the learning context, the approaches to learning, human interactions amongst participants, and the fitting of tools and processes to learning needs are particularly critical in order to make the learning a valuable experience. The Learning Delivery Environment will be discussed in more detail in the ‘Building E-learning Solutions’ paper that follows next in this series. An e-learning programme should be designed from scratch. This does not mean that existing course material has to be abandoned totally, just considered from a different perspective. Developing an e-learning solution does not need to take a long time either, so long as the initial analysis is done well and the right approach is adopted. There are a number of critical success factors involved in producing a successful e-learning programme, and many of them focus on the Learning Delivery Environment. They are discussed below. Firstly, like all major projects that involve organisational and process change, it is important to treat the effort as a formal programme. It is critical to have senior management support, as the programme can have impacts far beyond that of the implementation of new training courses. Many e-learning ventures fail because they have been regarded merely as a small project in the training department to convert training material to an on-line form. Others have been driven as a technology project, with learning coming secondary. The programme should be managed by an overall programme manager with real accountability and visibility, and should produce documented deliverables. It should be given budget and staffing, including full-time people where possible to ensure focus on the project is maintained. The scope should encompass business strategy, organisational change and technology support as well as learning design and development. It is critical to match the plans for such a programme to the available resources and to other activities within the business. Many people overestimate their capabilities, and underestimate the time involved when planning their first e-learning programme. The e-learning programme must enable and support existing business objectives and plans, otherwise it will not be seen to add value to the organisation. No programme can be contemplated without also considering the implications on the organisation and the effect of organisational culture and constraints on the programme. Often the culture of the organisation will dictate an approach to the learning. In practical terms, all constraints acting on the programme must be recognised – everything from budgets to skill shortages. Plans must be developed to manage within these constraints or to remove them. It is important to understand the true learning objectives, both of the design team and of the potential audience for this learning. Time and money can be wasted if the learning objectives are not clearly understood by the design team from the beginning. Classic errors in designing e-learning programmes are made by comprehending the objectives for teaching, but failing to understand the objectives of the students. A clear picture of the students themselves must be gathered – everything from the basic demographic profile to the likely motivation, computer literacy and hours of study. In many cases of classroom training, a teacher can adjust the approach to the course ‘on the fly’, as reaction to audience needs is immediate. However, if learning is to be achieved from a distance over a longer period of time, often with a larger audience, using mixed methods of delivery, then the course must be carefully designed to meet the needs of the students before it is implemented. Last-minute additions can certainly be made, but should only be done to make the learning experience a richer one. When the context in which the programme is to operate is fully understood, then the appropriate model of learning needs to be selected. An overall integrated programme may involve many different modes of communication, and will often be more successful than a monolithic single-method programme. This process has already been discussed earlier (see E-learning Dynamics Matrix above). Once an overall learning model and approach have been determined, then the content design can take place. Each individual component of the learning programme should be designed in a way to suit its delivery mechanism. Online learning must be designed to work as on-line learning, not as presentation slides forced into an online environment. In many cases, the on-line portions of e-learning courses contain far less content than their equivalent classroom courses. The content needs to be designed to work in an on-line mode, and must be easy to read and use. It has to be consistent throughout and divided into sections of the right size for learning and concentration. Often the navigation path through the content should be designed so that it may be determined by the learner, rather than being set by the instructor or tutor. Content and activities within the course should be engaging and motivating to the students, and high levels of interaction planned where appropriate to ensure consistent contribution from the students. Without periods of active learning the students will lose interest and may leave the course altogether. The right activities need to have the right delivery mechanism and a mapping of the learning objectives and activity definitions to delivery mechanisms is critical. Many people assume that classroom training should not be considered as part of an overall e-Learning programme, but it is often an invaluable component for items such as introductions, and for practice on specific physical or human-interaction skills. Online delivery mechanisms can range from a text-based facilitated discussion to an interactive simulation exercise, and could include audio or videoconferencing. Each has its strengths and appropriate uses for different types of learning activity. See the “Building e-Learning Solutions” section below for more detail. Often an e-learning programme will involve development by a number of people simultaneously and design and development standards need to be put in place to ensure consistency and transferability of skills. Students are also far less forgiving in terms of inconsistency of user interface and ease of use than with classroom material. Management and change control standards and processes often have to be altered to accommodate an e-learning programme. Changes can be completed far more quickly, and it is possible for many more people to have access to make those changes. Tracking of changes becomes more complex and the whole change control process usually needs to be reviewed. Developing e-learning solutions for the first time is a learning experience in itself for the team, and success is more easily achieved if the programme is divided into small achievable segments to minimise risk. Each of these segments should produce measurable deliverables and be seen to deliver visible business value, so that the overall programme justifies itself to the business and to the participants. Prototyping is essential, as is selecting the appropriate audience for giving feedback. The first project should be considered as a pilot, not only for students but also for the whole design, development and delivery team. Multiple iterations of the content and approach may need to be made, responding to feedback, and based on the practical experience gained through the process. The support model for an e-learning programme will often involve far more people with a wider variety of skills, compared to a traditional training programme. The staff will need to understand their new roles, be trained in the support process, and understand the change in support needs over time which inevitably occur in a major e-learning programme. Delivery of an e–learning programme is often very different from methods used in face-to-face situations. The instructor needs to be more of a facilitator rather than a knowledge-transmitter. The students will need more process guidance but less content support. Student support needs will vary depending on the maturity of their experience of e-learning, and may need to be particularly heavy during their first course. There are a number of key behavioural transformations that will need to occur in order to ensure successful learning delivery from both the instructor/facilitator and student perspectives. If instruction or tutoring is now to be from a distance and spread over longer hours, then the rewards systems for the tutoring staff need to be re-evaluated to see if they are now appropriate. The staff with the subject knowledge may end up taking a much more removed but focused role in the teaching of a programme, which may cause some concern initially. ‘Training days’ are likely to be less formally defined, and recognition of educational time needs to be built into the standard working timetable for employees. Working hours for support staff may need to be extended, and an understanding of the needs of remotely located learners built into the support processes and service level agreements. Throughout the organisation, roles and responsibilities may have to change, and completely new roles defined. E-learning programmes will need to be evaluated in a different way. Without constant visibility of the students, it is more difficult for a teacher to evaluate performance, or even to ensure that the student who has completed the work was actually the student named on the course. Group work is common, and different evaluation criteria will need to be devised for team activities. Apart from an evaluation of the students’ performance, there are a number of other areas that need to be considered. The quality of support of the students by the facilitators and subject matter experts, as well as Help Desk staff is a key area in the success of an e-Learning experience and must be evaluated critically with improvement plans implemented. The process of design and development of each new learning programme can generate areas for improvement that can help subsequent development teams and increase efficiency in the development process. Feedback should be gathered both during and after the completion of a programme and recommendations made available for future programmes. It is natural to consider that an e-learning programme results in one or more finite events from which students have achieved set learning objectives. However well-designed learning programmes develop strong learning communities which can persist beyond the formal learning sessions. Many e-learning programmes can in fact develop into networks and discussion groups, as well as spawning new and more advanced programmes for the participants. • Formally define the programme. • Understand the context in which the programme will exist. • Be prepared to look from a different perspective. • Review organisational changes and alterations in motivation, rewards and roles. • Design the programme to meet student learning needs. • Model the learning before considering tools and products. • Match learning components to the most appropriate delivery mechanism. • Prepare for a different type of support and teaching model. • Develop and implement new evaluation methods. • Allow plenty of time for a learning curve on your first project. • Consider the learning programme to be the start of a broader ongoing learning experience.